Tornado tables are far and away our favorite foosball tables to review. Some other table brands may limit what shots you can perform, so Tornado tables are the most recommended if you want to truly master the game. The Storm II Tornado foosball table has just about every feature we look for when analyzing a table for maximum shot performance, quality, and durability. This solid, heavy table will not slide around during heavy play. The wooden handles are easy to have a professional foosball grip and the rods are chrome plated, yet light in construction for quick rod movement. The tabletop surface is solid, level, and allows for fast foosball shots. The counterbalanced foosball men allow you to easily play 1 on 1 games because you can set the men horizontally without the fear of them falling down and getting in your way during game play. Leveling the foosball table with the adjustable leg levers is a breeze. 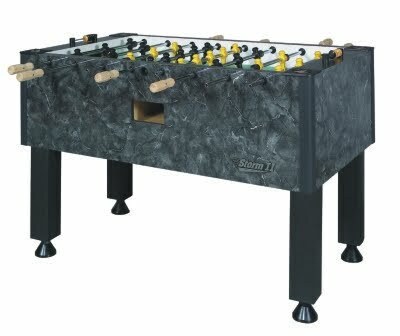 This foosball table is priced at around $850-$900 US.